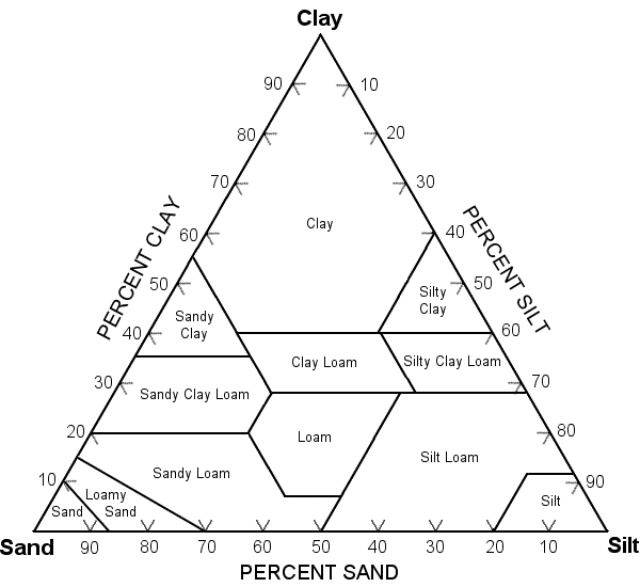 A ternary diagram is used to translate a sediment's proportion of the three different classes of grain size—sand, silt, and clay—into a soil description. To the geologist, sand is material with grain sizes between 2 millimeters and 1/16th millimeter; silt is 1/16th to 1/256th millimeter; clay is everything smaller than that (they are divisions of the Wentworth scale). This is not a universal standard, however. Soil scientists, government agencies, and countries all have slightly different soil classification systems. Without a microscope, sand, silt, and clay soil particle sizes are impossible to measure directly so sediment testers determine the coarse fractions by separating the size grades with precision sieves and weighing them. For the smaller particles, they use tests based on how fast the different sized grains settle in a column of water. You can conduct a simple home test of particle size with a quart jar, water, and measurements with a metric ruler. Either way, the tests result in a set of percentages called a particle size distribution. There are several different ways to interpret a particle size distribution, depending on your purpose. The graph above, specified by the U.S. Department of Agriculture, is used to turn the percentages into a soil description. Other graphs are used to classify a sediment purely as a sediment (for instance as ballfield dirt) or as the ingredients of a sedimentary rock. Loam is generally considered the ideal soil—equal amounts of sand and silt size with a lesser amount of clay. Sand gives soil volume and porosity; silt gives it resilience; clay provides nutrients and strength while retaining water. Too much sand makes a soil loose and sterile; too much silt makes it mucky; too much clay makes it impenetrable whether wet or dry. To use the above ternary or triangular diagram, take the percentages of sand, silt, and clay and measure them off against the tick marks. Each corner represents 100 percent of the grain size it's labeled with, and the opposite face of the diagram represents zero percent of that grain size. With a sand content of 50 percent, for example, you would draw the diagonal line halfway across the triangle from the "Sand" corner, where the 50 percent tick is marked. Do the same with the silt or the clay percentage, and where the two lines meet automatically shows where the third component would be plotted. That spot, representing the three percentages, takes the name of the space it's sitting in. With a good idea of a soil's consistency, as shown in this graph, you can talk knowledgeably to a professional at a garden shop or a plant nursery regarding your soil needs. A familiarity with ternary diagrams can help you understand igneous rock classification and many other geological subjects. Map of Natural Radioactivity in the U.S.